Posting named comments on top responses. Have you ever been the first person to show up for a party? That's the same discomfort users often experience when they're first to join a POPin. 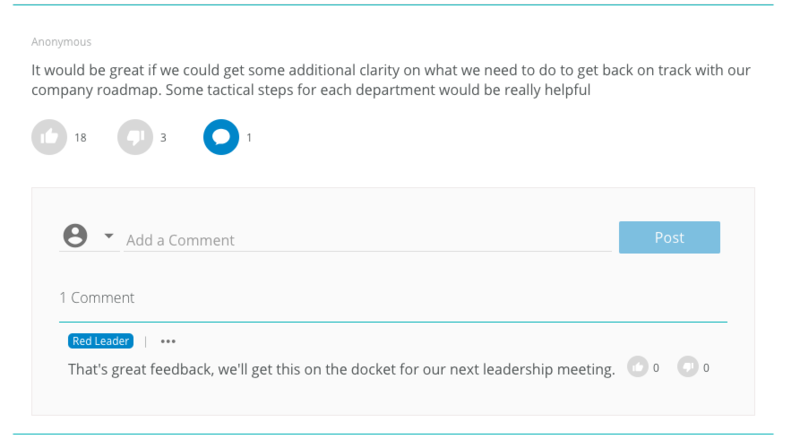 We recommend seeding one or two responses into your POPin session to get ideas flowing; once users see activity, they're far more likely to add a vote or comment, and even their own response. Pre-seeding is also a great way to test your own ideas. If your idea gets voted on as the "best", it becomes the group's idea and reaffirms your thinking. Click on the icon next to the "Add a Comment" modal. Select "Comment as [your name]" from the dropdown that appears. Leave a named comment for your users to engage with. Make sure to mention in the reminder communication you send your team that you've replied in the POPin! This goes a long way to drive continued engagement with your users. There are lots of strategies to encourage greater participation in your POPin (read more), but actively participating is one we have found to be extremely effective!